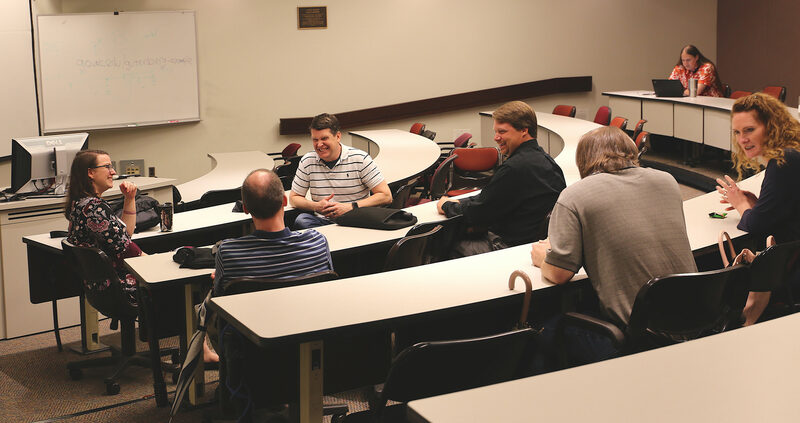 Carolina Technology Consultants boosted engagement among the University’s IT professionals and facilitated discussion of the latest technologies at the group’s annual BarCamp unconference on May 17. 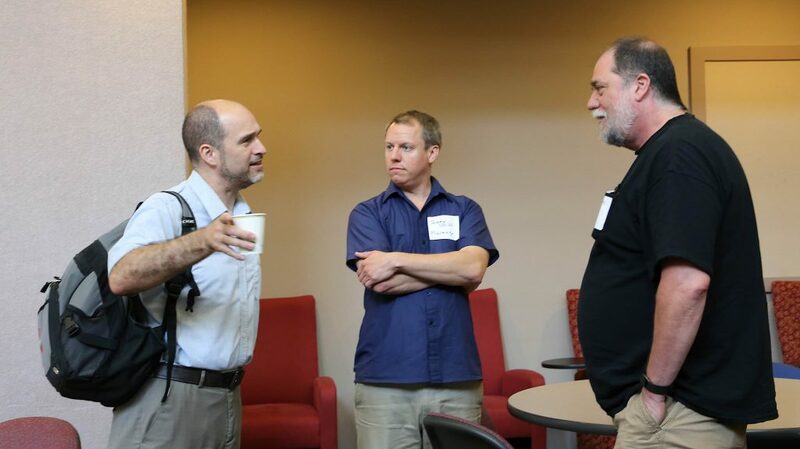 More than 50 technologists from across the University and beyond came together for CTC’s half-day event, surpassing the previous year’s attendance by about 15 people. Breakout sessions attracting the most people and generating the liveliest conversations included artificial intelligence, collaboration in the cloud and Office 365. Other sessions were held on WordPress Gutenberg, digital accessibility, SharePoint, Infoblox DNS, Blockchain, virtual reality/augmented reality, Mac management and code tests. 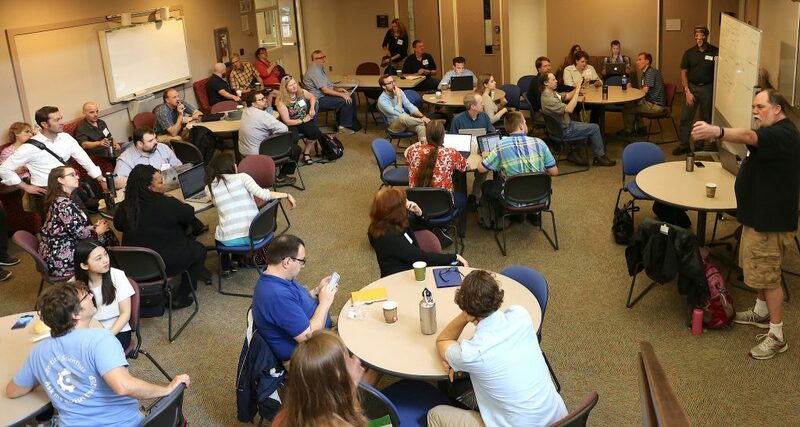 This BarCamp drew many first-timers and helped form and strengthen relationships among campus IT professionals. Pronouncements of “It was so nice to meet you” could be heard throughout the course of the event. BarCamp was held at Sitterson Hall and Brooks Building, which house the UNC-Chapel Hill Department of Computer Science. For the first time, BarCamp had vendor sponsors — Overleaf and CDWG, whose representatives manned exhibition tables and even attended some discussion sessions. Organizers promoted this event to more than the usual suspects. 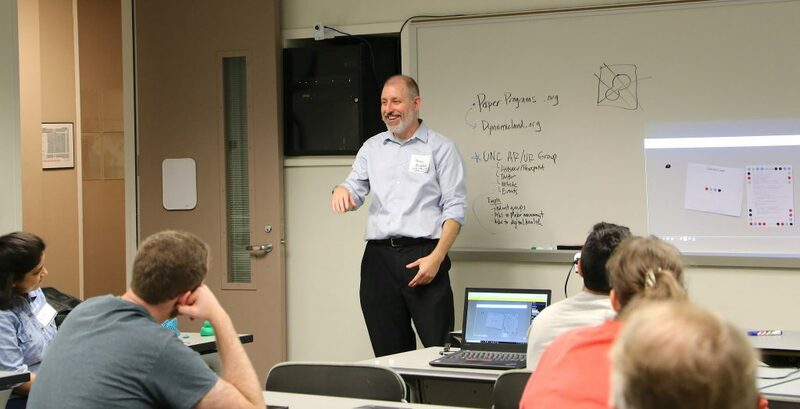 Brian Moynihan, head of health technology and informatics at the Health Sciences Library, encouraged members of his virtual reality and augmented reality group to attend. CTC also invited Carolina users of the Overleaf LaTeX SAAS license through Computer Science. Two of his favorite sessions were InfoBlox DNS and artificial intelligence. “Learning about these and other technologies, in a setting like BarCamp, helps me feel plugged in to what’s happening on campus,” he said. W. Patrick Gale, Web Applications Handyman and Data Librarian at the Thurston Arthritis Research Center, found the Office 365 discussions and roadmap updates for Office 365 very helpful. He also enjoyed hearing about collaboration tools that people are using on campus and the challenges they face with using these tools. He said he plans to test Yammer, one of the collaboration tools that was discussed. Hays was pleased with the turnout, especially considering the threat of a rainstorm, which led to cancellation of the OASIS cookout that usually follows BarCamp. Attendance also was stronger, he figures, because this BarCamp was held on a Thursday instead of a Friday. In 2017, the event lost some would-be attendees who took off for a long weekend. Hays thanked the vendors, CTC, Computer Science and ITS for their support of BarCamp. He is asking for suggestions for how to improve BarCamp and wants to hear from campus technologies who would like to continue conversations through a workshop or a working group. Ingram, for one, is already eager for another BarCamp. “The only negative,” he said, “is that there is only one BarCamp each year.” He would love, he added, to see it become biannual. Additional photos from BarCamp can be view on Flickr.